A quote made famous by one of my favorite philosophers, Heraclitus. A quote that has uttered from my boyfriend’s lips, too many times to count. I don’t know about you, but I like to change things up when it comes to breakfast. Of course I cycle through the usual rotation, but every once in a while, it becomes time to try something different. So when I saw the following recipe on the Minimalistbaker.com, I kept it Pinned until I accumulated some bread: ever since I’ve gone gluten free, bread has become a rarity in this kitchen. The following recipe was adapted from Minimalist Baker’s recipe, as I had nowhere near enough bread to make their 10 serving dish. Below you will find the two serving recipe. Check out their recipe for the full 10 serving dish. Have additional maple syrup for serving. -Grease a small casserole dish with dairy free butter. I used a 1-qt dish. -Add the cubed bread to the dish. -In a medium sized bowl, whisk the eggs, milk alternative, spices, syrup, and extract. -Pour this mixture over the bread. Using the back of a fork, press all of the pieces of bread down so that they are covered with the mixture. -How easy was that? Now just place some Saran Wrap over the dish, and place in the refrigerator until the next morning. -When you are ready to bake, preheat the oven to 350 degrees. Take off the Saran Wrap, and sprinkle the brown sugar, and cinnamon on top of the bread mixture. You can also add nuts, but I never put nuts on my french toast, so I opted out. -Bake in the oven for about 35 minutes or so. 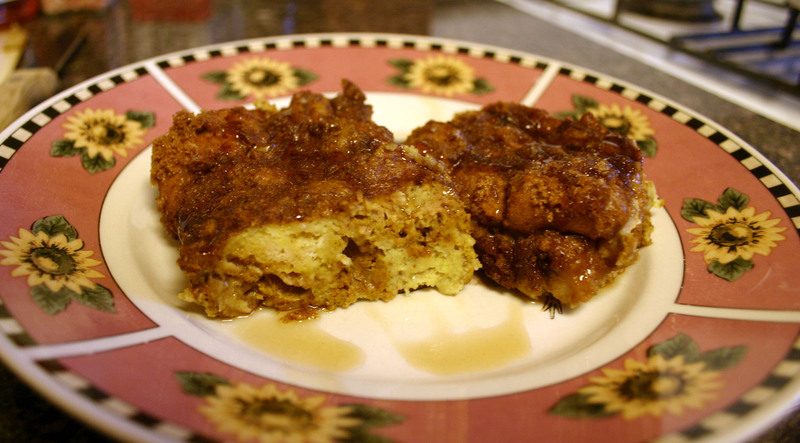 -Serve with maple syrup and enjoy the Pumpkiny goodness!